Disclaimer: This is my homeschooling journey story. To avoid my open letter to future homeschoolers and the homeschool haters, just scroll down to the bottom for the free homeschool lesson plans and curriculum resources. This post contains affiliate links for your convenience. Enjoy! 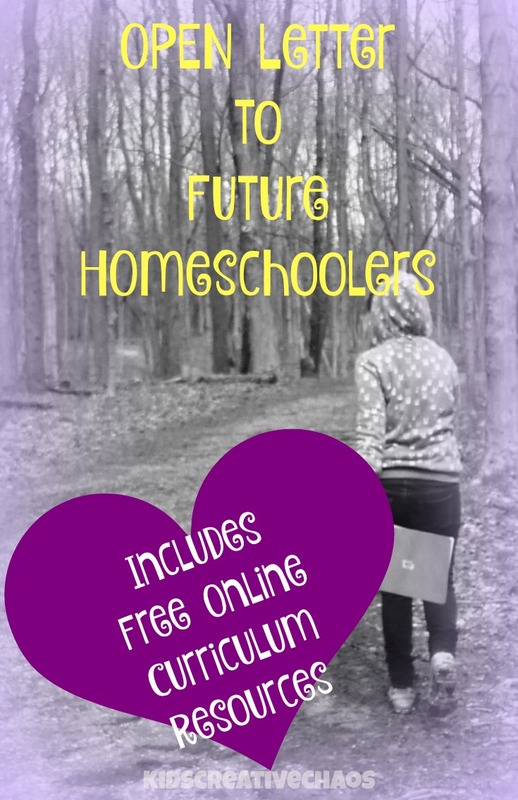 Open Letter to Future Homeschoolers: Free Homeschool Lesson Plans Curriculum. Should you homeschool? Deciding to take a homeschool journey is scary. Okay, terrifying! It doesn't help that people all around you are shaming you for it. They are telling you how weird it is. How wrong it is by saying things like: You'll make your kids weird, They won't have any friends, I'm just worried about socialization. Is that REALLY their concern? You can do it on your own with a free online public school, or with the aid of homeschooling websites that keep records of lessons and attendance. After I vent a little, I'll share some of our favorite homeschool resources for lesson plans, curriculum, and online learning opportunities. If you are going to homeschool, you will need to have a thick skin and lots of self-confidence to help you survive the homeschool haters and the sadly misinformed loved ones. Those non-homeschoolers. I think they're worried that people will think it's strange or it's wrong. I think they think that I am screwing my kids up for life. I think they're worried about how they will explain it to others. How they will justify the decision when talking to other people they know? If it weren't for perfectly well-meaning adults, homeschooling would be far less stressful. It's embarrassing for them to think that someone they care about is doing something so off the grid. Those shaming you aren't the only ones afraid that you will screw it up. You will always be second guessing yourself. Don't worry, you can do it! You don't have to be a genius, a teacher, or even very good an any subject. You just need a willingness to learn, a big dose of patience, and a bigger dose of perseverance. You always have to be on your toes, and so do your kids. You never know when another question is going to come out of left field. You never know when another "loved one" is going to shame you or your kids. You will probably live in fear that they will decide that you aren't doing a good job and report you to the "authorities." You'll worry, that the authorities, no matter how great a job you've done, will side with "the man." It is better for kids to be in schools, because each seat filled means $ for the school. Never mind the consequences to the child. Never mind, that in my case, the school (a teacher) was the first one to suggest the idea of homeschooling. I will check this post again and again, and still there may be typos. I can hear it now, "Wow, she homeschools her kids and she can't grammar properly." (That's a little joke the kids and I like to make.) Truth is, you don't have to know everything about everything to be a successful homeschooler. If your kids are weird, it is because your kids are weird. You are probably weird too or at least slightly outside the parameters of "normal." That's better than okay. Normal is boring. People, don't blame homeschooling! Poor homeschooling. What has it ever done to you? I like to think of myself as progressive. A think-outside-of-the-box-er. People often talk to me about conformity for my children. This blows my mind. They want to make sure my kids are conformist or at the very least, that they know how to conform. I think this is where the biggest breakdown between homeschoolers and non-homeschoolers comes into play. I don't want my kids to conform to societies norms. I don't want them to have a set idea of how their life is to play out: go to school, go to college, work 9-5 to keep food on the table, retire, die. That's fine for you, if that is your dream life. Well, as a matter of fact, that's fine for my kids if that is their dream life, but I want them to know, it doesn't have to go that way, if they don't want it to go that way. Every year, I ask if they want to go to a public brick and mortar school. It's their choice. We make the decisions together. After reviewing the state of our homeschooling last year, I asked the question, "Online public school, public school, or online homeschooling resources?" They vetoed public brick and mortar school, but they both told me that if I felt they needed to go to public school they would willingly attend an online public school again. Currently, the verdict is still out, we'll probably sign back up for Time4Learning (affiliate link). We've been doing Life of Fred* with Mom paired with unschooling (Montessori style), Khan Academy, Brainpop, and other online activities. Each week, on this blog, I try to plan and share an online lesson that they have to complete in addition to the other activities. The biggest obstacle to my dreams has always been the conformists. "You can't do that, do you know how many people actually succeed at that?" "You'll never accomplish that; I'm afraid if you set your goals too high, you will feel like a failure." Say what? I won't. I will only feel like a failure if I don't try to do something that I dream about doing. Be everything I can be and all that jazz. My mother states that I once was a conformist. She is sad to think that somewhere something went wrong. Sure, I used to do things that I was told to do, because I thought I had to... I did have to. There weren't other options. I had big ideas, but they weren't options. I wanted to do other things. Let's say, I didn't take the opportunity when it presented itself. I thought I couldn't. I felt trapped in a life that was stagnant. I didn't like it. I had tried to live out those conformist ideals, but they weren't for me. I went to public school. I applied, got accepted, and graduated from Ball State's School of Architecture. As a double major, I studied Technical Theater the whole time. It's a pretty big deal ( to a lot of people) to be accepted to study architecture. I can't tell you how many times I've heard, "Oh, why are you doing that! If I had a degree in architecture, I'd be using it. I'd be an architect." or "I always wanted to be an architect." I was born to act and to create things. Not skyscrapers. Not cookie cutter houses, just things! Do you worry that your kids won't be able to go to college? Did you go to college? Did you graduate? I don't care. Since I did attend college, I think I feel differently about it than those who didn't or couldn't. You know, it is that feeling of missed opportunity. The mourning of what might have been. I don't have that. Architecture was never my thing. I just thought, that's what you do. You go to college after you graduate high school. My parents had told me that my entire life. You see, they didn't go to college. The opportunity didn't present itself. I was the first one to go to college. That was special. I was proud, but it wasn't my favorite thing. I would do it differently if I had it to do over again. You can bet on that. What I'm saying is, I don't think college is for everyone. Everyone doesn't need to go to college. There are many ways to gain valuable career skills- college is just one way. I am grateful for that opportunity. That time meeting people who thought in a similar way that I did, who had big dreams with no doubts, who, even in their most conforming outfits or tennis shoes, were still non-conformists in thinking- I'd never lose that from my dossier. It helped me discover that I could be me, even if I was slow to the party. It took a long time to let go of twenty years of conformist teachings. I worked to find ways that I could be a non-conforming conformist. Get a job, a real job. Well, what's a real job to one person, isn't necessarily a real job to another person. Eventually, I took a 9-5 at a living history museum. I acted (interpreted), I sang, I baked bread, I swept floors, and I rode horses. What I didn't do was make a lot of money. It didn't matter. I loved what I was doing. Isn't that the real business of life? Being happy? Over and over I heard those conformist questions, "Why are you working for peanuts when you could be making so much more?" or "You are worth more money than that, you should ask for a raise! "or "Are you going to do this for the rest of your life?" or "You didn't need to go to college to work there." And, the familiar non-question, "If I had a degree in Architecture, I'd be working as an architect." Not once did anyone ever say, "You look happy!" or "Are you happy?" Too bad, because I was very happy. The job fulfilled all my needs. I always wanted to have a farm, to ride horses, to act, and to write scripts. There, I did all of those things and more. People whispered behind my back, "She got that fancy degree." or "She went to school all of these years and wasted her parent's money." Okay, not behind my back. A lot of people said those things to my face. I was content. This was enough. I was conforming (sort of) without really conforming. I didn't have to move far away from home, from family, or from friends and go to a strange new land. I was never hip on moving to a big city for those big city dreams. I just needed a creative outlet. I know what you're thinking. What the heck does all of that have to do with the price of beans? Actually, a lot. As the Manager of Museum Theater and Music, (The historical acting troupe) I met a lot of youth volunteers. These kids worked in the summer, but most of them worked in the fall too. They worked the same hours as I did. Do you know how? That's right, they were homeschoolers! Were they weird? Not to me. Actors have a reputation of being weird, you know. At first, I was awful. I said all of those horrible things that non-homeschoolers and ignorant people say. I was ignorant. I had only heard of bad things about homeschooling. I had only known people who were homeschooled because they got kicked out of school or they were extreme Evangelicals - not that there is anything wrong with either of those things. It just sits outside of societal "norms." These kids at the museum were cool. So cool, so smart. I was in my twenties, but I was envious. What a great life. What a way to experience life. Everyday, they were immersed in living history. They were prepping to fulfill their dreams while actually living life to its fullest. Still, I hadn't learned my lesson. I was still ignorant, a few years later, when I had my own play place for kids. One of my homeschoolers from the museum, lived in the same town (she guest posts here too). She had younger brothers that needed summer jobs. I hired them to help. When one of them came to me to see what he needed to do to apply to Ball State's Architecture department, I was less than supportive. "Believe me, it is difficult," I said. I thought, how is a homeschooler going to get in, what do they know? I practically had to jump through hoops to get accepted. Truth is, if I hadn't already had a 4.0 the first year of college, (from theater classes) I probably wouldn't have made the cut. I wished him good luck while promptly discouraging him from trying. First of all, I didn't want anyone to put themselves through that. I wanted him to understand how intense it was. How would they measure his ability? Does it sound familiar? What a hypocrite. I didn't want him to face failure for attempting something in which he couldn't succeed. Sad face. Yeah, it was a non-issue. He applied. He got accepted. End of happy story. Now, this really got me intrigued. Blah, blah, blah... two kids, two different sets of special needs. A move across town. An online public school to help ease into it. I was sold; we were officially homeschoolers! We're only weird if you think we're not "normal" like you. I might look like a conformist, but inside my brain is very, very, non-conformist. How can people not see that? Most think I'm just "quirky." Quirky now, eccentric in twenty years. Okay, ten. I'm old. We are certainly not unsocialized. If anything, we are over socialized. We are all very social people. We are always doing something, somewhere, with someone else. We want to spend more time at home. Because... ballerinas, olympic figure skaters, pianists, actors, free to learn their own way, live outside the box, stay away from bullying, no more school lock-downs, religious reasons, non-religious reasons, control over how they learn, control over what they learn, they don't want to get overlooked in an overworked school system. Those reasons, and oh so many more. Just because someone says they homeschool, don't assume they don't attend public school. One day, everyone will "homeschool." Mark my progressive words. Don't ask homeschoolers, "Quick, what's 2340 divided by 892?" Why? Because, they might have a learning disability. They might have Autism. You might look like a jerk. You will put someone on the spot and humiliate them whether they know the answer or not. Don't be a jerk! Shut up about cursive writing. If you want your kids to learn cursive, then teach them. Don't worry about other people's kids. Did you know that many public schools stopped teaching it? Did you know that many homeschoolers do teach it. If your kids go to a public school that doesn't teach cursive... just teach them yourself. "Well, how will they read historical documents?" I'll tell you, in a word, Google. I'll tell you in another word, Calligraphy! Do you know how to write in Calligraphy? I did, but I forgot. I bet you don't. I bet it hasn't stifled your progress in life. It is a new age. Also, if that is your big concern, you've probably led a charmed life. Lots of people have way more important things to deal with on a daily basis. Think survival. Historical documents? Really? Birthday cards... they'll figure it out. In case you wondered, we are learning cursive, albeit slowly, but we're learning. We have a fairly charmed life too. If you are a CONFORMIST you CAN homeschool too! You can. You can do an online public school or you can do it on your own in a traditional format. You can teach cursive or whatever you want. You can hold school every day from 8-3. This is the beauty of homeschooling! We do some kind of educational experience nearly every day of the year. We are always learning. Always, probably far more than those who attend public school. Don't feel bad if you try it and you don't like it. It may be overwhelming. It is very stressful. I'm not advocating it for everyone; I'm only defending my personal choice. It isn't easy. Some people don't have the patience or the persistence needed to succeed. Homeschooling gets a bad rap from the few homeschoolers who don't do a good job. If you aren't fully committed, please don't do it! Give it a try; if you don't like it, just move on to the next thing. Then, chalk it up to been there, done that! This is a free online public school. They send you free textbooks, school supplies, materials, and a headset. Brainpop has a yearly or monthly fee for their online school activities. They offer a daily free educational video with a quiz which is great. They also offer free lesson plans. This is an online program similar to Brainpop, but without the fun videos. This is a free online program. It is excellent for older students. They do math very well, and they are always adding new classes. There are video lessons and quizzes for most grade levels. We offer many online lessons and plans in history, science, math, English, and more. Each lesson is in blog post format and designed to last the entire week. You'll find links to kid-friendly videos, free printables, and fun online educational games. These books use a story format to teach English and math for all grade levels. We love them! They are easy to read. In the math books, he takes the opportunity to teach grammar whenever possible. In the English books, he teaches math concepts. Basically, he teaches with "real life" scenarios. Never mind, that Fred is a five-year-old college professor.